Cannabis is big business. With legalization closer than ever in the state of New Yorkpolitical, social, and economic forces are convening in the Big Apple to create a rich and fertile soil that will germinate the legal cannabis industry in the state of New York and beyond. Cannabis is making giant leaps forward from the shadows of the black market to the modern, digital age. And New York is seizing the opportunity. At present, only medical patients who have been prescribed cannabis by a physician to treat conditions such as chronic pain, depression, and epilepsy can purchase cannabis in New York. State regulations also require dispensaries to sell the medical cannabis through a medium of tinctures (cannabis resin dissolved in high proof alcohol), vape pens, or gel caps. Flower strains and edibles like cookies, cakes, and gummy bears are not legally sold in NY dispensaries. But changes are coming soon. 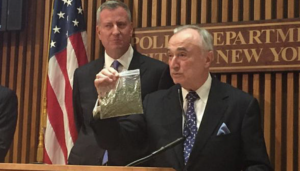 Last week, Mayor De Blasio ordered the NYPD to stop arresting people for smoking marijuana (NOTE: is cannabis the right context here? Many of the sources I’m reading use marijuana) in public. Citizens of New York appear to agree that decriminalizing public cannabis consumption is the right thing to do for the state. Mayor De Blasio’s order appears “blunt,” but it may become a challenge to implement if it compromises the safety of NewYorkers. One of the common first hurdles facing states bringing in legalization, that the NYPD in turn will have to face is handling drivers who test positive for THC when involved in accidents or traffic stops. Colorado, 5 years into legalization, still struggles in this challenge. first hurdle NYPD will face is . The second major question is how police enforcement will treat those on parole, probation, and those with outstanding warrants who get busted for cannabis. People who fall into these categories currently face more extreme consequences. There’s divided opinion on whether these “exceptions” are positive and warranted, or if it demonstrates the state’s continued commitment to cannabis criminalization. One Los Angeles cannabis company, MedMen, is once again betting big. And this time it’s on New York. MedMen has recognized that New York’s political forces are no longer resisting the tides of cannabis legalization. The company is leveraging its position as an industry leader to shape the tides and bring normalization of cannabis onshore. MedMen manages and owns over a dozen cannabis dispensaries and cultivation operations in CA, NV, and NY. And these are not the dumpy head shops of the past. reflects the company’s desire to usher cannabis into mainstream consumer culture through elegant, elevated, and ergonomic product designs. Their aesthetic choices indicate that the cannabis industry has come a long way from reefer madness, the evil “Marihuana” and stereotypes of lazy hippies clad in rasta colors previously associated with cannabis culture. A comparison can be drawn between the changing perceptions of those who choose to participate in the cannabis industry and the unraveling of stereotypes in the toy industry. Some of the most well-known toys in America are the Barbie and Ken dolls. Barbie and Ken are clean-cut, physically fit, and generically attractive. The foundation upon which Barbie, Ken, and many other toys were built is entrenched in sexual stereotypes and traditional gender roles. Over the past 20 years, however, the $15B+ industry has been feeding new dolls into its toy pipeline because it has recognized the unraveling of those stereotypes in society at large. Barbie’s voice box no longer says “Math class is tough!”, and she and Ken now come in a wider swath of body types, ethnicities, and fashion styles. As of a few days ago, MedMen’s vanguard now extends further north than New York. They began trading under ticker MMEN on the Canadian Securities Exchange because the Canadian capital markets have been friendlier to U.S. cannabis companies than NASDAQ and its regulatory hurdles. MMEN stock closed at $4.95 Canadian dollars ($3.85USD). MedMen is just the latest cannabis company to tap our friendly, northern neighbor for a broader investor audience. MedMen went public via a reverse takeover (RTO). In a RTO, a private company takes over a public one. The corporate gymnastic maneuver known as the RTO has become the preferred way to go public for cannabis companies. In a RTO, the private company (in this case, MedMen) absorbs a public one (in this case, Ladera Ventures), thereby giving the former company access to capital. For U.S. based cannabis businesses, the RTO paved the path to a fully legal market. Ladera Ventures was a shell company listed on the TSX Venture Exchange in Vancouver, Canada. Cannabis and blockchain-based companies are simultaneously racing to Canada for cash. RTO’s have become so popular among both cannabisand blockchain-based companies that some people are even concerned that there may be a shortage of these public shell companies in the future. As the supply of “clean” public shell companies (devoid of legal baggage and financial liabilities) whittles down, these remaining shells will wield more leverage to negotiate better, higher priced deals for themselves. In connection with the RTO, MedMen raised $110MM through a private placement deal. According to the company, Med Men’s implied valuation is $1.65B USD. New York is a state that prides itself on its commitment to progressive policies. Nine states surrounding it including Massachusetts, Vermont, and Maine have legalized cannabis for recreational use. New York may be late to this party, but it certainly has the economic and political momentum to catalyze the normalization of cannabis throughout the country.